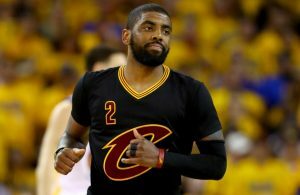 (Los Angeles, CA) – Behind a combined 69 points from Kyrie Irving (37) and LeBron James (32), the Cleveland Cavaliers completed a Staples Center sweep by knocking off the Los Angeles Clippers, 126-121, on Friday night. The win marked the team’s second straight victory in Los Angeles in as many nights, and closed out the five-game Western road swing on a high note. Cleveland was without the services of power forward Kevin Love, who sat out the game with back problems after taking a late charge in the Thursday night win over the Los Angeles Lakers. Love’s status was questionable in the hours leading up to the contest before being scratched prior to tipoff. The Cavs were on the verge of letting the game slip away in the third quarter, when they then put together a 37-18 run to take control of the game. The Clippers led 89-80 with 3:28 left in the stanza, but the Cavaliers pieced together a 10-4 run to chop the deficit to three at 93-90. Each team then scored a basket to close out the quarter, with Irving hitting a jumper with just 0.9 seconds left to make it 95-92 when the horn sounded. At the 10:31 mark of the fourth, James’ three tied the score at 97, though Los Angeles answered with a three-point play to take a 100-97 lead. 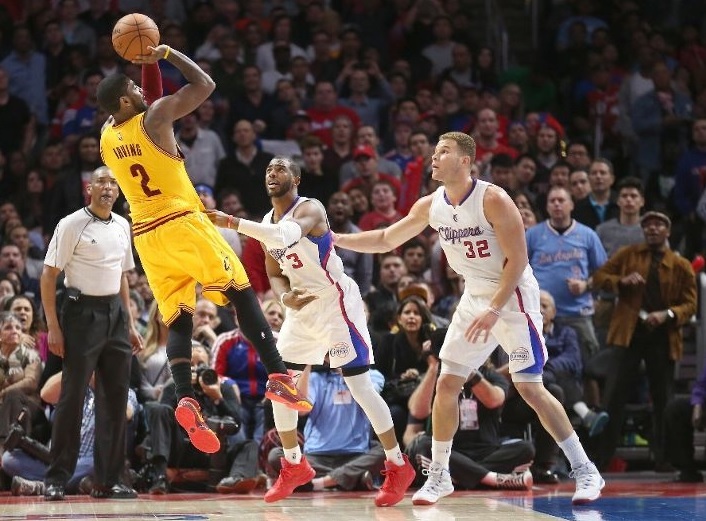 Irving and James then combined for seven unanswered points to give the Cavs a 104-100 lead with 9:07 to play. With Cleveland holding a 107-104 lead less than two minutes later, a Timofey Mozgov alley oop was followed by a James jumper to give the Cavaliers a 111-104 lead with 6:30 left. Another James three would give the Cavs their biggest lead of the game at 117-107 with 4:35 remaining, but the Clippers battled back with six consecutive points in less than two minutes. An Irving basket with 1:54 left pushed the margin to six, but an apparent Shawn Marion floating jumper with 1:10 left that would have clinched the contest was overturned by replay when it was determined it came after the shot clock had expired. Los Angeles scored to reduce the lead to four, but James then fed an inbound pass to Tristan Thompson in the paint with 46.4 seconds left that led to a three-point play for a 122-115 lead. With a 123-117 advantage, Cleveland was ready to salt the game away when the Clippers turned the ball over, but Blake Griffin stole the ball at midcourt and went in for the dunk with 14.6 seconds remaining. After a timeout, the Cavaliers threw the ball away on the inbounds pass, though James argued that Chris Paul interfered with him. 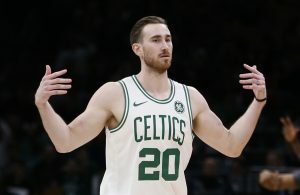 Paul then quickly scored on a layup with 11.1 seconds to go, but a pair of free throws by Matthew Dellavedova with nine seconds left and one by James with 3.5 seconds remaining closed out the victory. Early on, a tightly contested first quarter saw seven lead changes and four ties, with a pair of five-point leads by the Clippers serving as the biggest margin. The first time came when Los Angeles held a 12-7 advantage with 8:51 to play, which led to an 11-3 run by the Cavaliers capped by a J.R. Smith jumper with 5:55 to play. Both teams then began trading leads or knotting the score, with James’ driving layup tying things up at 26 with 2:15 remaining. For the rest of the quarter, the Clippers scored seven of the last nine points to make it 33-28 after the opening 12 minutes. A 13-1 run early in the second by the Cavs gave them their biggest lead of the half at 44-38 with 7:52 to go before intermission. Then, with just under four minutes left in the quarter, Thompson’s layup made it 53-48 Cleveland, but the Clippers put together a 16-8 run the rest of the way to take a 64-61 lead into the halftime locker room. In the third quarter, Cleveland scored six of the first seven points to take a 67-65 lead, but within a couple minutes, a J.J. Redick three-pointer sparked a 10-1 Los Angeles run to make it 79-72 with 6:31 to play. That lead would increase to nine a few minutes later, which is when the Cavaliers made their move. 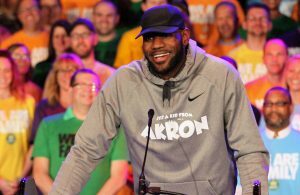 The Cavaliers now return to play their first home game since January 7 when they host their Central Division rival, the Chicago Bulls in a 7:30 pm ET contest that will be broadcast nationally on TNT.